The first in what might be a series of reviews. I was at the bookstore the other day, more-or-less stocking up for what ended up being a fictional trip to China, and after picking out a selection of books, I wandered over to the magazine section of Borders. The goal of magazines at a newstand-type setting is to catch customers’ eyes, so they completely overspend and make an impulse purchase instead of saving oodles of money with a subscription. My eyes wandered across the fast cars, the cleavage, and the heroic-looking sports poses, and I stumbled across the word “Pirates” in a large, offensive typeface. Next to it, in smaller type, “Magazine.” YES! 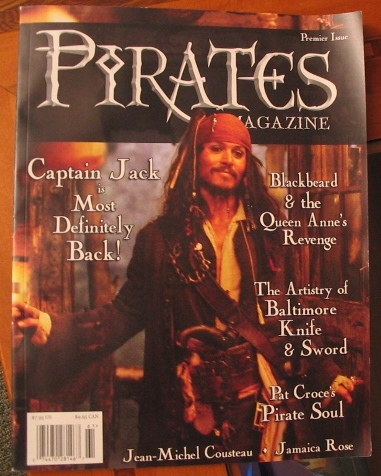 Whether it was a magazine for pirates or pirate enthusiasts, I plopped down my $7.95 (minus 2 stars right there), and put on my ridiculin’ hat. Some communities should just stay on the internet. I’ve never been a fan of people taking things I don’t care about too seriously. I could make some sort of list here of examples, but at the end of the day, let’s just admit that the list would contain pretty much anything you could think of, and the real challenge would be in the taxonomy of it all (grouping Hershey’s Chocolate Enthusiasts with people who love Mike and Ike because of the whole candy thing). In the “hobbies I don’t respect” category, we’d find the Renaissance Fair fans, people that dress like comic book characters, movie characters, Star Wars characters, and so on. Though these people bother me in concept, for the most part, they’re off in their own corner of the internet, arguing about whether Qui-Gon Jinn could beat Saruman, then dressing up and living out the fight and getting out of breath, so hey to each his (or, rarely in this case, her) own. So, when “they” crossed over from internet phenomenon into a group seemingly legitimate interests, I did not like it one bit. Obviously this magazine was created to capitalize on summer 2006’s second biggest movie, X3. So, what exactly does one put in a what will (in theory) end up being a quarterly magazine? Well, judging by the cover alone, not buxom wenches, some pirate history (Blackbeard & the Queen Anne’s Revenge), pirates in pop culture (Pirates of the Caribbean), profiles of people bringing “pirate” back (Pat Croce), the details of the construction of the ill-advised Christmas gifts that people’s grandmother’s buy on QVC (The Artistry of Baltimore Knife & Sword), as well as treasure hunting (Jean-Michel Cousteau), and other piratey sounding things (Jamaica Rose, whatever that is). All-in-all a good mix for the overly enthusiastic, but at a rather full 88 pages, they’re going to struggling for content after, I don’t know, issue #1. The Bookshelf’s experience with the printed word proved two things 1) we can do anything we set our mind to do, and more seriously 2) one issue is easy – two, not so much. In all honesty, people that collect such things probably love to know the detailed process that goes into making collectable swords and knives, and again, there are probably people out there interested in doing something as close-to-pirate-like-as-possible such as a real-life treasure hunt, but really, you’d think that advertisers would realize that addressing the potential customer with “You be wantin’ to be a pirate?” or things like that might get old after, I don’t know, five pages. Pirates Magazine Premier Issue – The Cover receives two stars due to the fact that even though I have no respect for their hobby, it seems to address things that I’d be interested in if I were a pirate enthuasiast. The title isn’t so hot, though it doesn’t lead the customer guessing the contents of what he has in his hand. I’ve yet to really delve into the magazine, but so far, in terms of its art design, it’s somewhere between “professional” and “Look at all these buttons in InDesign!” There’s enough Times New Roman to kill a, um, giant sea-faring enemy of a pirate and some of the ads look like something from my high school year book, but there is something to be said about what might be called its “rustic” charm, and the authors do a reasonably good job avoiding easy pirate jokes. But, paging through, I can’t help but notice items in the magazine geared towards “re-enactors.” That’s really the bottom of the barrel in terms of “geekdom” — see the left side of this chart. A special note about this chart: It was made by that Lore guy who beat us to the whole “reviewing anything” schtick, and we’re still bitter about it, especially considering the quality and accuracy of the chart. Anyway, judging the the magazine by its cover alone, it gets those two stars (two stars off for the only-for-enthusiasts pricing and one star for the whole ‘promoting things that really shouldn’t be promoted’ thing). It really reminds me of “Chew” magazine from Calvin & Hobbes, with Calvin enthusiastically reading the whole issue very seriously while Hobbes just didn’t get it. (Bill Watterson probably meant it as some not-too-subtle jab at crass consumerism, and that was even before the internet catered to even “nicher” interests). I’ll leave with this: I’m not particularly interested in anything, and I’d never pay $8 or even $10 for an imported British car magazine. Twice. I also live in a glass house.